What’s not to love! How stinkin’ cute is this to begin with? I know right? The colors are so cute and sweet, the attached toys are engaging, fun and allow for me to attach additional toys or a sippy cup holder. 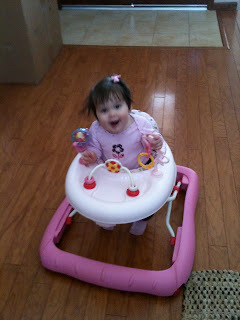 Learning to walk has never been this much fun! The Bright Starts™ Pretty in Pink™ Walk-a-Bout™ is perfect for baby girls who are on the move. The high back seat provides extra support as baby is perfecting those steps and getting stronger. 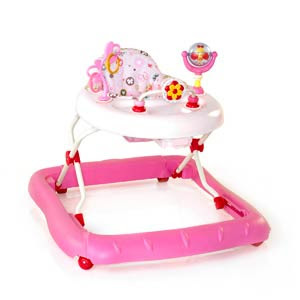 Also, the 3 position height adjustment allows the Pretty in Pink™ Walk-a-Bout™ to grow with baby and be used over time. 3 fun toys and 2 links for attaching more toys will keep baby entertained while on the move. The Pretty in Pink™ Walk-a-Bout™ conveniently folds for storage. 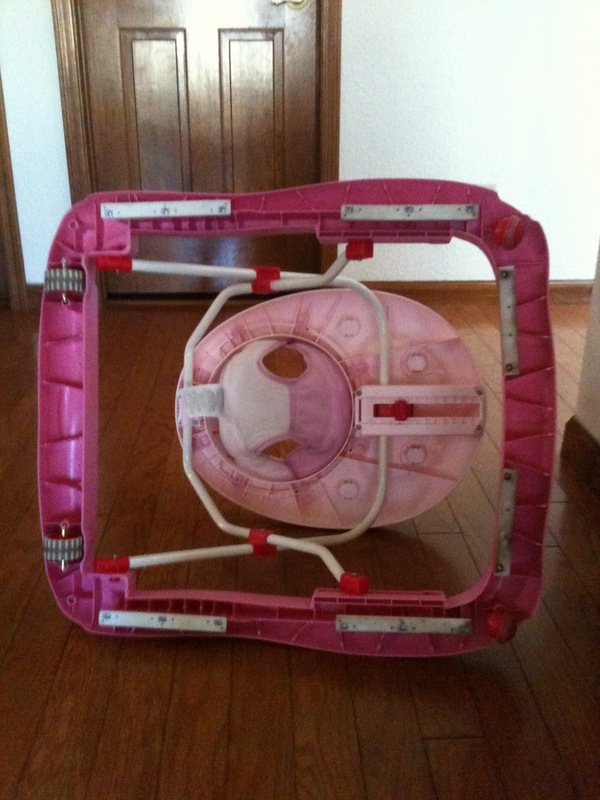 When it first comes out of the box, it is in a few pieces but I found it VERY easy to put together, even with a curious kid hanging on to your pants saying “Mama Mama Mama…” and I only smashed my finger once! And for someone who walks into walls pretty regularly, that’s a great sign. As I was first putting the seat portion together I noticed how easily the washable fabric comes off for cleaning and how narrow the seat itself is. This makes the walking motion easier as opposed to the more stiff or bulky fabric seats I’ve seen with other walkers. It also has 3 easily adjustable height differences and collapses down to a very low profile which is good for travel or storage. The base is more narrow then old bulky walkers but still very stable so I can see this being great for people in smaller homes, apartments or places with narrower hallways. Now comes the real test, how would Boogie do in it? Now, this isn’t our first rodeo when it comes to walkers. We were given a 5 year old hand-me-down boy themed walker a few months ago from my sister-in-law. Audrey hated it. She liked to play with with toys on the tray but all she would do it go backwards. Sit her in. Watch her back into a wall. Turn her around. Watch her back into the opposite wall. Turn her around. Do you notice anything about these photos Um, maybe that they are not in focus? Yeah hard to get good photos when THE KID WON’T SIT STILL! I put her in and off she went! IN A FORWARD DIRECTION! Like she had been doing it all along! Also, notice I have all real wood floors which worried me at first since real wood can be damaged easily but so far I haven’t seen one scratch, scrape or dent! Next came a safety concern… We have a sunken formal living room that is now used as a play room that means a step…DOWN. And it happened. I turned around and saw she was right on the edge and before I could run to save her life….. Hey wait, what happened? Why did Boogie just not plummet the 6 inches to her doom? Those white strips are actually bumpers or stoppers, when they touch the ground they actually stop the walker from moving entirely. This is, in my opinion, the best feature for the type of house we have. We even took the walker to test it out over at my in-law’s house where she has tile floors and several area rugs since I was curious how it would do on those. The rugs didn’t seem to slow her down one bit with the exception of one small one but it slides and has fringe so it was just moved out of the way while we were there. They also have a back patio with a step which the safety stoppers worked perfectly on and a back walkway covered in pavers that was no match for my newly mobile monkey! Momo & Papa’s back patio. In the end, everyone in the family is happy. Rutherford loves being chased up and down the hallways by a laughing and screaming Boogie. I love that I know I can set her in there and not have to worry about her trying to climb into the fireplace to eat rocks (Worlds Best Mom Award!) and that she is safe to run around to her little hearts content. The mutts surely feel safer knowing that they aren’t going to squished and loved to death at any moment….but they do need to watch their tails. Beanie learned that one the hard way. Check out my video wrap up with a cameo by Beanie, the menace wiener dog. 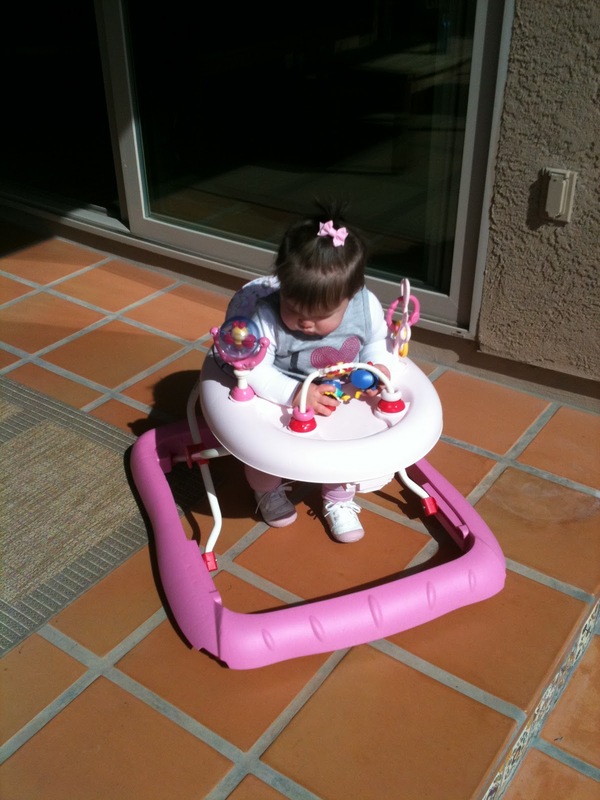 You can find more information on the Walk-a-Bout walker, as well as, where to buy and the entire line of Pretty In Pink toys, gear and accessories at www.kidsii.com! 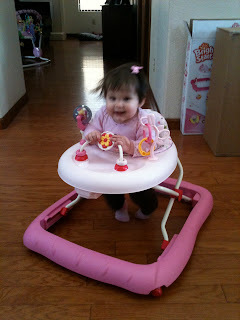 I was given this walker by Kidsii PR with the purpose of doing this review. I was in no way compensated in exchange for a good review. I just really think this is awesome sauce. Now go buy their stuff.